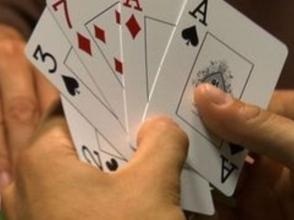 While some poker variants are suited to both casino play and home games, there are others which are arguably not. Shotgun is a game which falls pretty squarely in that latter category; it’s a form of draw poker which means that at some point players have the opportunity to discard and replace any or all of their cards. Shotgun is unlike any other poker variant but the aim remains to create the strongest five card hand according to standard hand rankings. It’s also possible to play according to Lowball rankings or even High/Low as long as all the participants agree beforehand. Shotgun begins quite normally with five cards dealt to each player; we think this is a game best played with an ante so each player adds a small mandatory bet before the action begins. The draw now follows and each player has the opportunity to discard and replace none, any or all of their cards. Now it gets interesting because the ‘Roll Out’ phase begins during which players must first organise their cards into an order of their choosing before placing them face down in a pile on the table. Each player now turns over their top card so it is visible to everyone else and a round of betting follows. This is repeated four more times with four more rounds of betting until all cards are revealed and the showdown effectively takes place, assuming more than one player remains in the round. This game is also known as Roll ’em Out for obvious reasons and The High/Low version is also know as Skinny Minnie.